This year’s three-time CMA nominee Jason Aldean returned to his hometown of Macon, GA last week for his third Concert For The Kids charity event at the Macon Coliseum which raised over $620,000 for Beverly Knight Olson Children’s Hospital, Navicent Health. 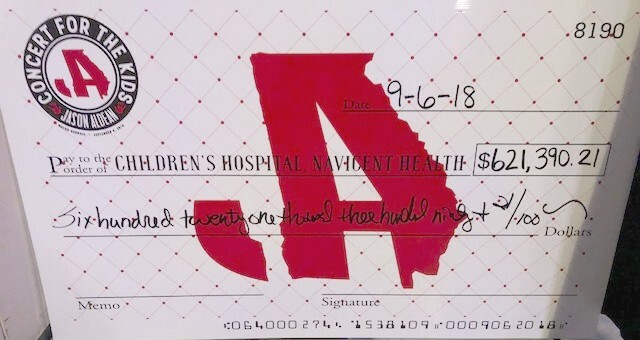 Aldean has now raised nearly $2 million for the region’s only dedicated pediatric facility, serving central and south Georgia that enhances the lives of children through patient care, research and education. Continuing the momentum, the three-time and reigning ACM “Entertainer of the Year” headed back to Nashville to host another capacity crowd at Nashville’s Bridgestone Arena for his full-throttle HIGH NOON NEON TOUR. For more information and for a full list of upcoming tour dates, visit www.jasonaldean.com. For more information on Navicent Health, please visit www.navicenthealth.org.